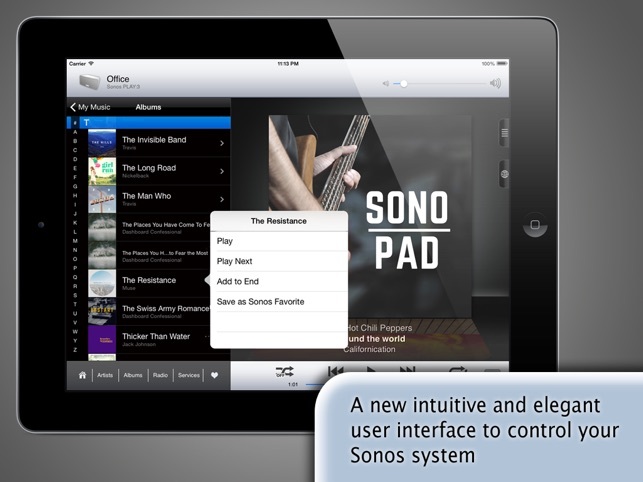 SonoPad is the first full fledged third party alternative Sonos remote control available for your iPad. 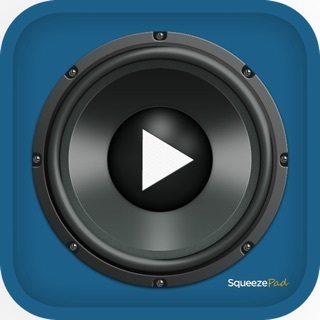 Also don't miss my new App "SonoPhone" for iPhone! or come over to my homepage www.sonopad.com with much more information and screenshots available. - volume + progress popups: when changing volume or progress of a song, you get popups telling you the actual values. Stop guessing your desired values today! 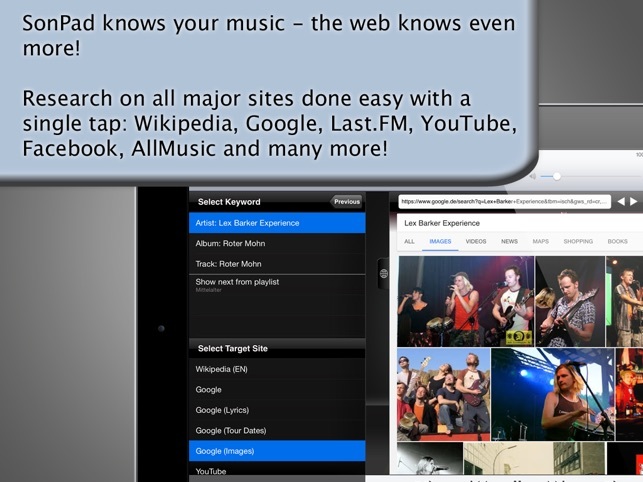 - pregenerated links and searches based on your playlist: you are just a tap away from Wikipedia, Lyrics search, Tourdates Search, Last.FM, YouTube, AllMusic, MusicBrainz and many more. SonoPad tries to optimize most often used tasks to have the least taps needed. In the end you are able to navigate and control your players much more fluently. 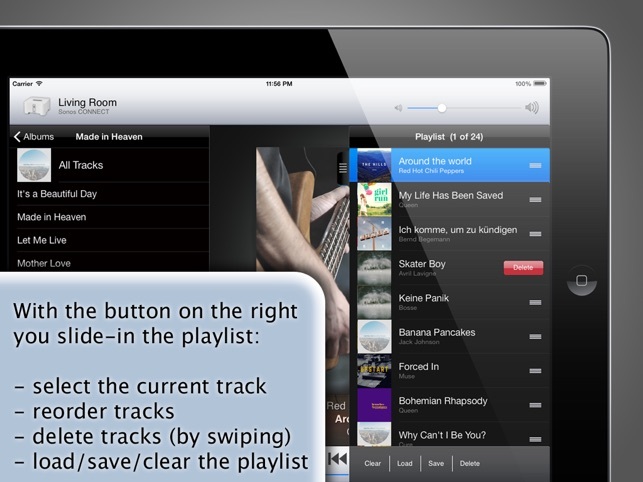 - shortcuts to most used functions: on the bottom bar you have shortcut buttons for artist, albums, radio and musicservices. The Radios menu is rearranged so you are only two taps away from your radio favorites from any place. 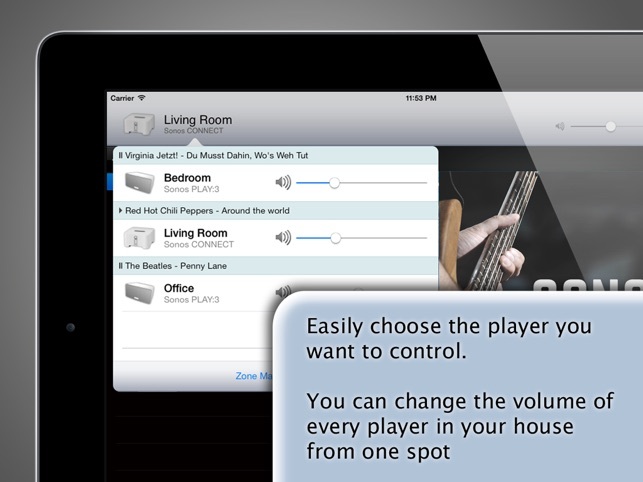 - you can control the volume of every player directly from the players popup. No need to switch players anymore. - No portrait mode on the main screen yet. - you can start SonoPad with the 'sonopad://' URL from other remote Apps. Its also possible to hand over a return URL and a default player to be selected. Read more about it on my blog! - Sonos is registered trademark of Sonos, Inc.
- with version 10.1 Sonos introduced changes to the zone management, which made SonoPad not being able to render synchronized players properly. 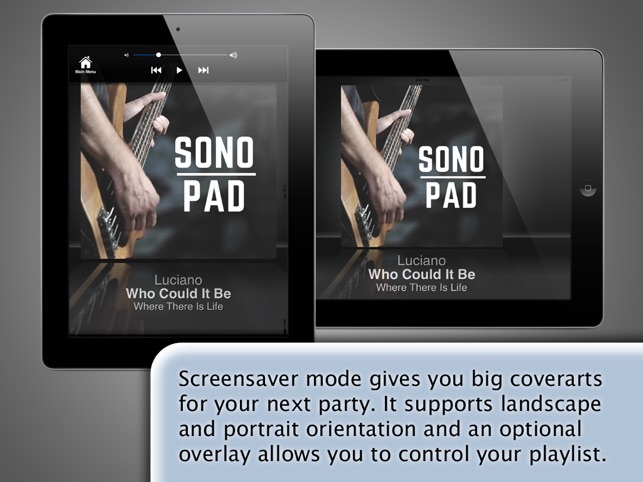 This version makes SonoPad compatible with Sonos 10.1 firmware version again. Of course backwards compatibility to older Sonos firmware versions is kept. Was exited to find an app that would work (the app from Sonos is a joke). But, this app is not a good as it sounds. It’s not intuitive. It doesn’t find playlists like it should. When it does and loads them, it doesn’t play anything even though you click the play button. It’s weird the way it does load playlists, then has to load them again in the play list-play side. The really stupid thing is, when I open the native Sonos App and got it to play (finally), THEN this app turned right around and was playing the same play lists. If I turned playlist off in this app, it auctioned on the native app. Just kluge. And while the developer is nice, there is simply ZERO help files out there. So now, I have paid for an app that isn’t working and difficult to use and a native Sonos App that is a joke and doesn’t work correctly at all. Which means, my Sonos system is now all junk to store in the garage. This is infuriating. I would not buy this again. you wrote me via support and together we found out that you were trying to play music directly from your iPad - which is not supported by this App (as written in the description). I offered you a refund, because noone should pay for an App or system that is of no use to him. You never responded to this, instead it looks like that you use your AppStore comment to express your dissatisfaction with Sonos as a whole system. The AppStore description links to a YouTube video by the way, which shows you all available features and how they work. As everything else should be self explanatory there is indeed no further documentation (besides the websites which also contains some blog posts about some special advanced features). Finding your Apple Music is difficult and the interface to do this needs updating. Albums will load into playlists in disorder and not in order of album. Search mechanism needs work. All in all I would not buy again. Great App; GREATER customer support!!! NOTE: I wrote this the day before he updated the app. Since it doesn't show up under "current version" reviews, I have reposted. I am very pleased with this app. I find the interface more visually pleasing than the Sonos app. The quick access to Artist info is very nice. The GUI for Zone Managment is very nice, as is volume control. However, by far the greaest part of my experience has been with support. I had an issue that caused the app to freeze frequently. I wrote the developer, who responded in about 12 hours. I sent him the requested logs, he found the problem, and had an update issued--all of which happened in less than 48 hours from my first email. This is superior service!! !